St. Luke’s Hospital - Anderson Campus in Easton, Pennsylvania, is one of America’s newest hospitals, a magnificent facility designed to promote healing and equipped with state-of-the-art medical technologies. Since opening in mid-November 2011, the hospital’s goal is naturally to provide a great health care experience but the hospital also prides itself on providing a great human experience as well. In keeping with that ethos, St. Luke’s sought to do something extraordinary with its façade and chose to decorate it in an energy-efficient wash of dynamic colored light from Martin Professional. “Our goal was to celebrate the opening of our new hospital in a creative and significant way and chose to explore architectural lighting options that would create a dramatic, lasting effect,” says Sue Ross, Director of Marketing & Public Relations, St. Luke’s Hospital & Health Network. “After conducting considerable research, we contacted several firms, including Eslinger Lighting, to discuss the scope of the project and ensure they could deliver the desired result. To fulfill the energy efficient and color control requirement, Eslinger, a Pennsylvania-based, full service entertainment and installation lighting company, chose the Exterior 400™, an LED color-changing wash light from Martin Professional with tight beam spread and impressive power. The RGBW color mixing Exterior 400 provides up to 5300 lumens of light at narrow beam angles and is one of four luminaries in Martin’s Exterior 400 Range. The outdoor LED wash luminaires operate at a low 139 watts of power and feature color calibration to ensure uniformity in projection. Internal power and control makes them easy to use and straight-forward to install. The Exterior 400 fixtures are mounted on concrete pads strategically placed around the hospital and wash bright shades of color onto columns without shining light into patient rooms. 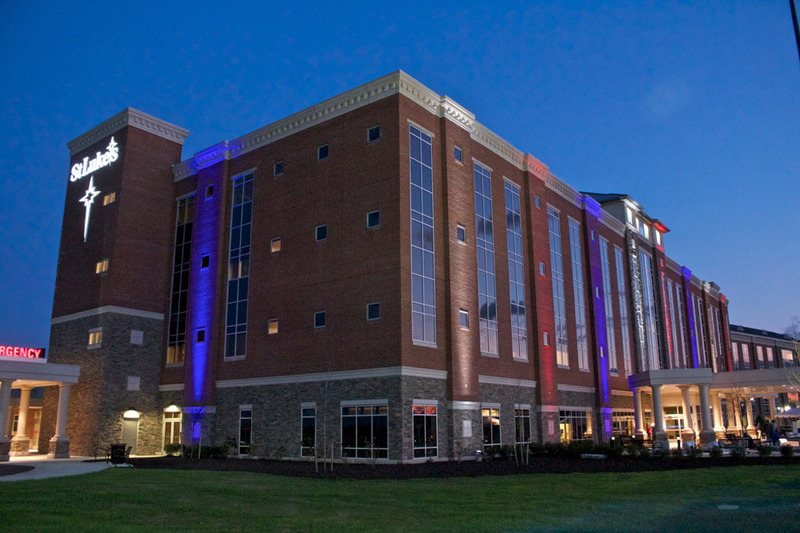 For the hospital’s grand opening, the fixtures alternated red, white and blue projection around the building in a salute to Veterans Day.